GM will introduce its battery-powered Chevrolet Volt car in China during the second half of 2011, but volumes won't be significant, GM officials say. (Bloomberg) -- General Motors Co. will introduce its battery-powered Chevrolet Volt car in China during the second half of 2011 as automakers add more fuel-efficient models in the nation. “The volumes in China won't be large,” said Kevin Wale, president of the U.S. automaker's China business. Many Chinese consumers are first time buyers and aren't environmentally conscious yet, Wale said. GM and its partner SAIC Motor Corp. join carmakers Nissan Motor Co. and Daimler AG in planning to sell cars powered by batteries in the world's biggest auto market. China, the world's largest oil importer, is offering buyers of such vehicles subsidies as the country seeks to cut its dependence on the fuel. GM, the biggest overseas automaker in China, didn't specify sales target or price for the Volt in China, which will cost $41,000 in the U.S. before subsidies when it's introduced next month. The Volt, which can travel about 40 miles using batteries, will be sold as the Opel Ampera in Europe from next year. The models also include a gasoline engine that extends the driving range to as much as 360 miles. Given the lack of charging infrastructure in the country and the high price of electric cars, China will be a tough market for such cars, said John Zeng, an analyst from J.D. Power & Associates. 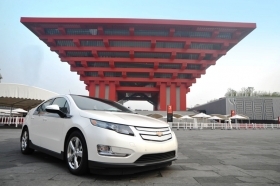 “The Volt will serve more to enhance GM's green image,” Shanghai-based Zeng said. China has overtaken the U.S. as GM's largest market by sales volume, as government subsidies boosted buying. Even so, GM earns more profit in the United States than in China. GM assembles the Volt at a plant in Detroit, Mich.
GM's North America operations had profits before interest and taxes of $1.59 billion in the second quarter, while the company's international operations, including China, earned $672 million. Nissan, whose electric car Leaf goes on sale in December in the U.S., may introduce electric cars in China, Chief Executive Officer Carlos Ghosn said in September. The Japanese carmaker is in talks with China's Dongfeng Motor Group Co. about the “best way” to do it, said Ghosn. The Leaf runs only on battery power and can travel about 100 miles on a charge, according to Nissan. China said in June it would offer as much as 50,000 yuan ($7,510) toward the purchase of plug-in hybrid models and up to 60,000 yuan for vehicles that run only on batteries in five Chinese cities on a trial basis. The nation may subsidize purchases of at least 4 million energy-efficient vehicles by 2012, the National Development and Reform Commission, China's top economic planner, said in June. Daimler, the world's second-largest manufacturer of luxury cars, and BYD Co., the Chinese automaker backed by billionaire Warren Buffett, set up a 50-50 joint venture in May to develop electric cars in China.